After all the different pickup-making techniques I’ve experimented with along this particular journey, I’m back to making cardboard bobbins. Why, you ask? Well, first of all the bobbin flanges need to be very thin. Like .02”. I was using Garolite and FR4 before, but I was using cylindrical pole pieces; drilling 1/4” holes into the flatwork is relatively easy. 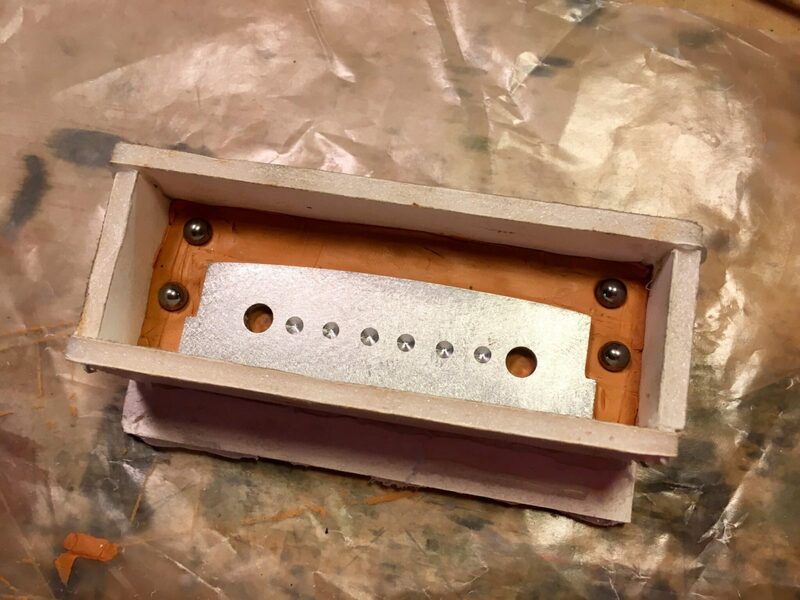 The ceramics are bar magnets – cutting nice slots into the Garolite or FR4 by hand is no fun. No fun at all! I figured I’d get those pieces laser-cut ‘cuz it’s pretty cheap. However, there was a monkey wrench in my plan! Most of the stiffer industrial plastics they have available at the hobby-grade laser cutting places are things like Delrin or polypropylene and they are resistant to glues and such. Other plastics they had aren’t chemical resistant. I called around, and none of them seem to want to cut FR4 and stuff like that. So, cardboard. And that’s fine. It’s easy to glue and the bobbins are really easy to make. I just cut a 3/16” strip of stiff architectural paper, wrap it around a magnet that I use as a form, and tack it on to the pre-cut bobbin. Plus, the pre-cut cardboard flatwork is cheap – like 20¢ each. The only downside is that it’s not very strong and the bobbins are prone to flaring. I may have to do a slightly looser wind with 44awg instead of 43 – which I think will be OK. I don’t think it’ll change the sound enough so that it will be a deal-breaker. I dunno – I’ll experiment with that. Bruce showed me these things he’d made to sandwich his bobbins onto his winder. I’ll have to make something similar to keep the bobbins from flaring. I’ll coat the sandwich thingies with wax and leave the wound bobbins in there while I apply the Penetrating Epoxy Sealer. Once that hardens for a day or two, I can take them out. Theoretically, the copper wire and cardboard bobbins will be just one hard happy lump of epoxy-coated goodness. After that, I gotta make a new master for casting. The old one, pictured below was made for cylindrical magnets. I need to cut one with a slot. Using the limited tools I have at my disposal will make this an interesting project to say the least! Yay! My custom fabricated ceramic 8 magnets came in!